California family takes root in Kentucky and takes over Kentucky’s LARGEST winery!!!! We are THRILLED to announce that Elk Creek Vineyards is under NEW management. On October 22nd Barry, Karin, and Fred Papina signed papers with Curtis Sigretto to take over Elk Creek Winery, LLC. Papina Legacy Winery, LLC is a family owned business with a 145 year-old vineyard & winemaking history. Fred and Carol Papina have been married for over 50 years, they have 3 children including their son Barry and daughter-in-law Karin Papina who have blessed them with 5 amazing grandchildren. The Papina’s currently live in Northern KY, and are looking forward to making Owen County home! The Papina Family has a love for vineyards and wine. The Family is originally from St. Helena California and has a vineyard that has been in the Family for 145 years. Papina Family Vineyards, located across the street from Charles Krug Winery and down the street from Behringer Winery, produces high-end Cabernet, Petite Verdot, Old Vine Zinfandel and Old Vine Petite Sirah. The grapes are used in wines that are crafted by some of the top wine makers in Napa. The property has always been a special place and one that is very coveted in the valley due to its incredible soil and perfect growing conditions, which includes natural shelter for the vines from frost. The patriarch of the Papina Family, Fred Papina, has been involved in the care of the vineyards since he took over management of them in 1958. Fred has always been very fond of vineyards and grape production from a very young age. At 24, he maintained the vineyard by himself and learned from family and trial & error what worked best to keep the vines producing great vintages. Fred & his wife Carol were incredibly excited to find out that Elk Creek Vineyards was for sale in Owenton since purchasing a home in Burlington to be closer to their Son, Barry and his family. Barry & Karin, who moved back to Kentucky in 2004, also share a special love for vineyards and wine. In fact, wine is a common bond between Barry & Karin’s families. Karin Wormald Papina, whose family is all, originally from Kentucky (Dayton, Newport and Covington) had moved to California when her father, Dan Wormald a former P&G employee had accepted a job with Clorox in the San Francisco Bay Area in 1980. Dan always loved wine and was inspired to start creating his own wines being surrounded by incredible vineyards all over the Bay Area and in Napa County. Karin and Barry met in 1990 and married in 1993. All of the wine for their wedding was produced by Dan and was made from grapes cultivated from the Papina Family Vineyard. They have 5 children and are looking forward to continuing the family tradition of vineyards, wine & importance of family. The Papina Family plans on continuing to run winery as Elk Creek Vineyards but manages the winery as Papina Legacy Winery, LLC. They are looking to continue their family tradition and create a winery and vineyard that they can be proud of and continue the family traditions for decades to come. Already planned for 2016-2017 are several new wines that will be a part of a ‘Dedicated’ series that will have the Elk Creek Name but will be based on designs of wines from the St. Helena and Napa Valley. All of these wines will be given a release schedule and will be available for pre-order via the Elk Creek Vineyards website (elkcreekvineyards.com). 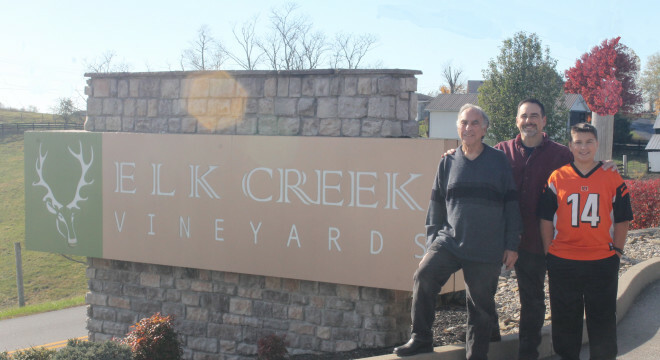 The Papina’s are also planning on continuing producing all of the wines that Elk Creek is known for and that people love. Also planned for the Winery are replanting a large number of the vines that were lost due to the severe winters that ravaged Kentucky vineyards over the last few years. The Papina Family is dedicated to bringing back Elk Creek Winery as a premier destination for wine lovers and all who enjoy the best of what Kentucky has to offer. They would like to wish everyone a blessed Thanksgiving and invite you to bring your family to the Winery for their Black Friday Sale 10am-7pm on November 27th! We wish you great success in your new venture Bary and Karin. We know you will produce a quality product in the coming years. How could it not be so, from a quality family? We are looking forward to sampling your first new vintages.